Atlas and the Anchor: 22-20's - "Shake/Shiver/Moan"
Today marks the long-awaited return of the reformed British blues-rock band the 22-20's; with their sophomore album, Shake/Shiver/Moan, on tbd Records. If you have been following the band and this blog, you would know that they gave their fans a glimpse of their highly anticipated new music by releasing a live EP for free download on their website earlier this year as a teaser for the new album. The studio versions of those four tracks as well as six others are presented here with a blues-inflected indie rock sound improved upon during the group’s demise and subsequent return. The album opens with the propulsive and hypnotic “Heart On A String” with its arena-sized chorus. “Bitter Pills” mixes early 90’s Brit-pop with their brooding bluesy sound on the stand out track from which they took their alias when they first reformed and played secret shows. “Talk To Me” bristles with a raucous riff, blazing solo and a shuffling beat along with a super catchy chorus just begging for airplay. The psychedelic “Ocean” features waves of twangy sitar-like guitar and breezy Yardbirds-esque harmonies, proving they are more than just a one trick pony. The first single, “Latest Heartbreak”, is a hard-charging, uptempo blues-rock song with bittersweet harmonies that captures the band’s live energy. The title track, “Shake, Shiver and Moan” slithers in with acoustic guitars and excellent harmonies but stomps its way out with electric fury. The poppy, uptempo “4th Floor” is a time machine back to the Brit-pop heyday. And “Morning Train” is introspective and slower-paced, closing out the album with hymn-like harmonies, acoustic guitars and a steady beat. 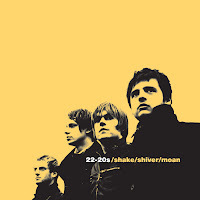 With almost five years between releases, some may have forgotten about the 22-20’s but with Shake/Shiver/Moan, frontman Martin Trimble and company have made sure they won’t be forgotten again! Free Friday: New Idea Society - "Quiet Prism EP"
Luke Wesley - "Because We Never Talk About It"
The Futureheads - "The Chaos"
Free Friday: De Novo Dahl - "Tigerlion"